Last September, Apple introduced discounted Apple Music memberships, offering 12-month subscriptions for $99, only available through prepaid gift cards from stores and authorized resellers (and via PayPal Gifts). This price meant savings of about $20 ($19.88 to be exact) for Canadians instead of paying the usual $9.99 per month. 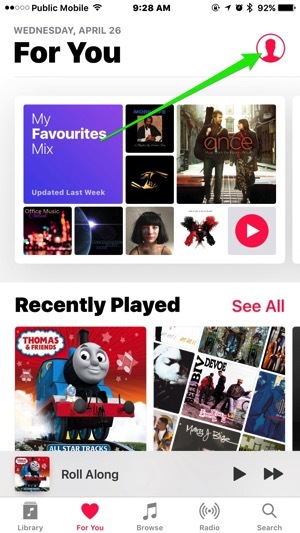 But now it appears Apple is offering the 12-month Apple Music subscription for $99 to everyone without the need to go through these gift cards. 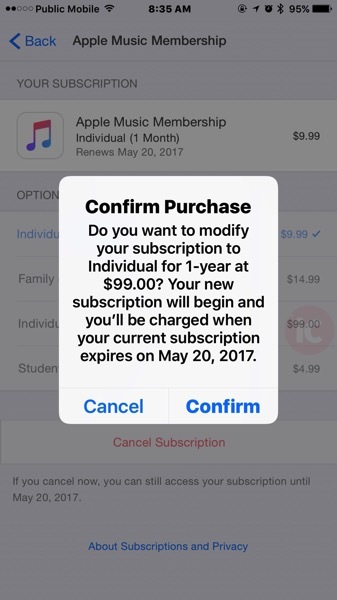 The $99 option can now be chosen when you manage your Apple Music subscription via the web or your iOS device. 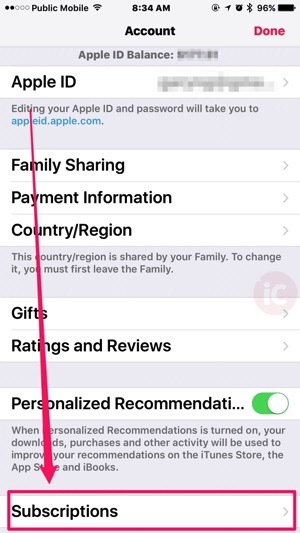 Apple’s support document on managing an Apple Music subscription was updated last month to include details showing the $99 option available from an iOS device. If you’re currently on a month-to-month $9.99 Apple Music plan, if you want to save a few bucks, the $99 annual subscription is definitely worth it—especially if you’re funding your iTunes Account with discounted 20% off iTunes Cards from Costco’s periodic sales. 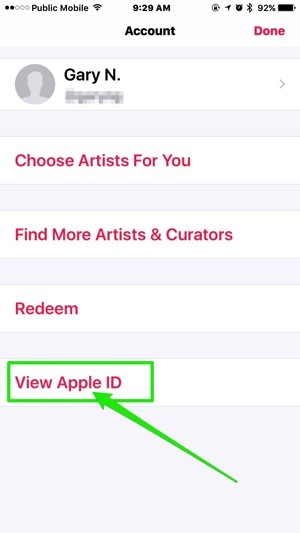 Taking the discounted iTunes cards into consideration, you’ll be effectively paying $6.60 per month for Apple Music (oh baby). The option to switch your subscription is also available via iTunes on the desktop and your Apple TV. 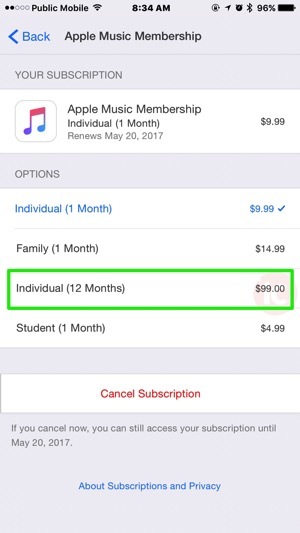 Since our iTunes Account is funded with 20% off iTunes Cards from Costco, coupled with this $99 Apple Music 12-month option, we’re now paying $6.60 per month for Apple Music ($99 – 20% off from Costco iTunes Cards = $79.20/12 = $6.60). Let us know if you’re going to opt for the 12-month Apple Music plan for $99—It’s a no-brainer if you’re already enjoying the service. Now you can get the discounted price without visiting a store.